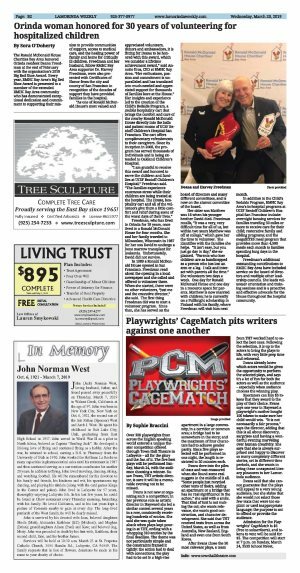 The Ronald McDonald House Charities Bay Area honored Orinda resident Deana Freedman at the end of February with the organization's 2018 Big Red Shoe Award. Every year, RMHC Bay Area's Big Red Shoe Award is presented to a member of the extended RMHC Bay Area community who has demonstrated exceptional dedication and commitment to supporting their mission to provide communities of support, access to medical care, and the healing power of family and home for critically ill children. Freedman and her husband, fellow RMHC Bay Area supporter Dr. Harvey Freedman, were also presented with Certificates of Honor from the city and county of San Francisco in recognition of the decades of support they have provided families in the hospital. 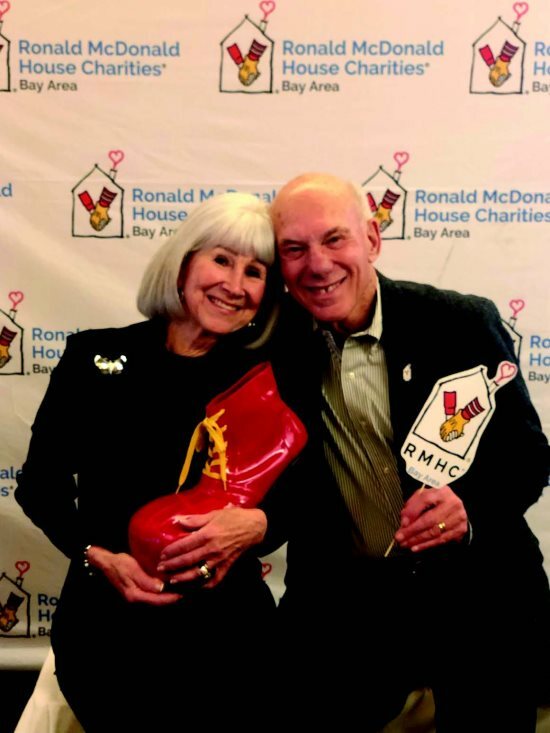 "As one of Ronald McDonald House's most valued and appreciated volunteers, donors and ambassadors, it is fitting for Deana to be honored with this award, which we consider a lifetime achievement award," said Annette Eros, CEO at RMHC Bay Area. "Her enthusiasm, passion and commitment is unparalleled and has translated into much-needed and appreciated support for thousands of families here at the House." Her insights and experience led to the creation of the Child's Bedside Program, a mobile hospitality cart that brings the comfort and care of the nearby Ronald McDonald House directly into the halls and patient rooms of UCSF Benioff Children's Hospital San Francisco. The cart offers complimentary refreshments to their caregivers. Since its inception in 2008, the program has served thousands of individuals and is being extended to Oakland Children's Hospital. "I am grateful to receive this award and honored to serve the children and families at UCSF Benioff Children's Hospital," Freedman said. "The families experience enormous stress while their children are being treated at the hospital. The House, hospitality cart and all of the volunteers give them a little comfort and relief during some of the worst days of their lives." Freedman, who has lived in Orinda for 18 years, once lived in a Ronald McDonald House for four months. She and her family traveled to Milwaukee, Wisconsin in 1987 for her son David to undergo a bone marrow transplant for leukemia. Unfortunately, David did not survive. In 1989 a Ronald McDonald House opened in San Francisco. Freedman read about the opening in a local newspaper and she called and offered to volunteer there. When she started, there were no other volunteers, "just me and the executive director," she said. The first thing Freedman did was to start a volunteer program. Since then, she has served on the board of directors and many different committees, and is now on the alumni committee of the board. Her older son Matthew was 16 when his younger brother David died. Freedman recalls, "It was a very, very difficult time for all of us, but within two years Matthew was off at college," which gave her the time to volunteer. She identifies with the families she helps. "It isn't easy, but you just go day to day," she explained. "Parents who lose children are as handicapped as a person who has lost an arm or a leg. I talk and interact with parents all the time." She volunteers two days a week. One day for Ronald McDonald House and one day in a resource space for parents. Matthew is now married with children; he is currently on a Fullbright scholarship in Finland with his family, where Freedman will visit him next month. In addition to the Child's Bedside Program, RMHC Bay Area's in-hospital programs at UCSF Benioff Children's Hospital San Francisco include: overnight housing services for families traveling 50 miles or more to receive care for their child; restorative family and sibling programs; and the megaBITES meal program that provides more than 4,500 meals each month to families spending long days in the hospital. Freedman's additional outstanding contributions to RMHC Bay Area have included service on the board of directors and multiple other leadership councils. She leads volunteer orientation and training sessions and is a proactive and effective advocate for the House throughout the hospital community.